Experience Botswana in sheer luxury, as you fly across the Okavango Delta and marvel at the meandering waterways and abundant wildlife. Sight the hippos, lechwe and beautiful birds in the Okavango delta as you walk through the islands and go on game drives in the floodplains. Your Botswana holiday starts at Maun Airport where you will be received by our representative. You will be transferred in an exclusive seat-in-light aircraft and will be transferred to Chitabe Camp where you will spend the next two days. 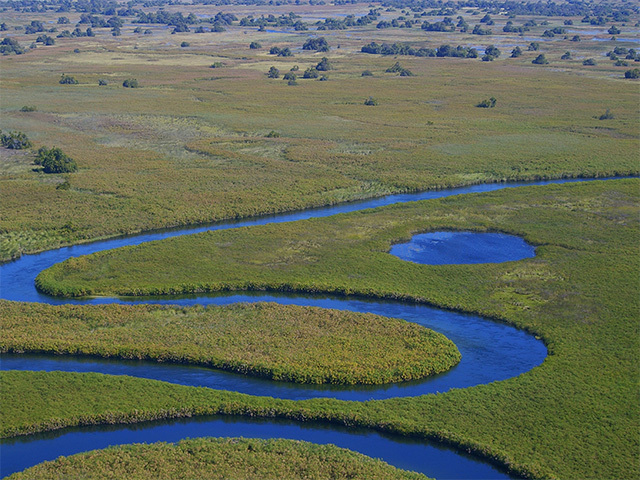 Chitabe Camp is situated on a beautiful island in the Okavango Delta, which is the world’s largest inland delta. This area is a home for wildlife and has an abundant variety of species including African Bush Elephant, African Buffalo, Hippopotamus, Lechwe, Topi, Blue Wildebeest, Giraffe, Nile crocodile, Lion, Cheetah, Leopard, Spotted Hyena, Black Rhinoceros, Warthog and even the endangered African Wild Dog. You can go on safari drives in open 4X4 vehicles, undertake nature walks and watch our birds. You can also take part in night safaris which will give you the opportunity of sighting nocturnal wildlife like civets, serval, genet, porcupine and aardwolf. The camp is set in a spectacular location and also provides an added feature of “sleep out” platforms. These elevated platforms are located in the reserve and gives you the unique opportunity of sleeping under the stars in comfort and safety, and waking up to the sight of the sun rising over the sparkling waters of the Delta. Today you will be transferred from Chitabe to Kwetsani Camp where you will spend the next two days. You will be flown by a light aircraft to the camp at a time suggested by the camp management. 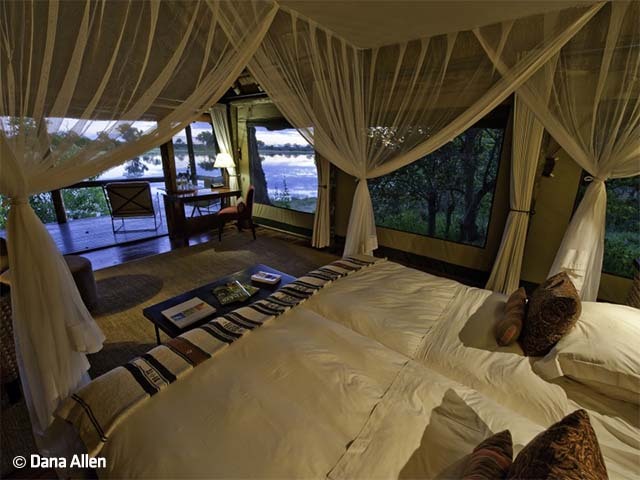 The Kwetsani Camp is situated in the Jao concession in the heart of Okavango Delta. This area embodies all that is unique to the delta, from the beautiful islands fringed by riverine forests to the amazing wildlife. Okavango Delta is a popular birding destination and has large concentrations of endangered Wattled Crane along with Slaty Egrets, Rosy-throated Longclaws, Pel’s fishing - Owl and African Skimmer. Some of the wildlife that can be sighted near the camp is herds of sitatunga antelope, red lechwe, hippo and crocodile. In the dry season lechwe, tsessebe, elephant, wildebeest, zebra are sighted, while the lion, cheetah and leopard can be sighted on the floodplains. While at the camp you can undertake both land and water activities depending on the annual flood levels of the delta. You can go on game drives as well as mokoro (dugout canoe) rides in the meandering waterways. Walking through the islands on foot is also a great option you can explore, though you will have to take prior permission for that. In the nights, you can use the option of spending it in a platform hide situated in the reserve and sleep out under the beautiful starry sky. You will embark on your journey to the next camp, Savuti Camp, where you will be spending the next two days. You will be flown by a light aircraft to the camp at a time suggested by the camp management. The Savuti Camp is located in near the Savuti Channel is Northern Botswana. The Savuti Channel is a deep clear waterway, a habitat for hippo, aquatic wildlife and myriad varieties of birds. The area thrives with wildlife and the game concentrations here are high, particularly in the winter dry season, and apart from abundant plains game, species such as roan and sable antelope, southern giraffe, lion, leopard, cheetah, spotted hyena, black-backed jackal and wild dog may also be encountered. In winter, this area can also be excellent for the sought-after aardvark and aardwolf, which are big ticks on anyone's mammal lists! Wildlife viewing can be undertaken in so many ways at the camp right from day and night game drives to nature walks with guides. 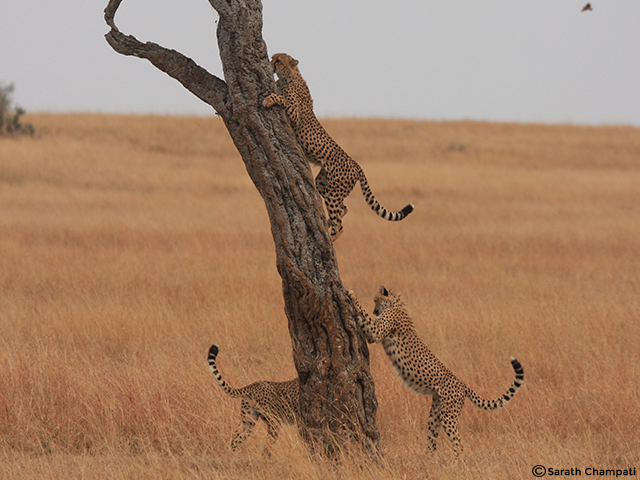 There are also several well –positioned hides for safe, up-close animal viewing. Your trip to the wilderness of Botswana ends today and you will be transferred to the Maun airport for your connecting flight back home.